BT’s forthcoming 300-500Mbps G.fast broadband technology won’t just be used to upgrade homes. 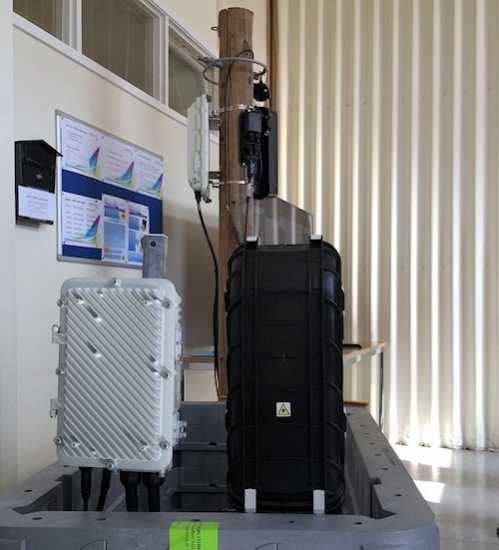 The operator has also claimed a “world first” by using the G.fast to supply a cellular Cloud Radio Access Network (C-RAN) over copper lines, which could be used to support 4G and future 5G mobile services. Admittedly we won’t see 5G based Mobile Broadband networks until 2020/22 and we still don’t even know for sure what those networks will actually look like. But one thing we do know is that they’re bound to need more data capacity and that’s where the new C-RAN setup could help. However C-RAN networks, which are used to connect cellular base-stations to a mobile operator’s core network(s), often require a dedicated fibre optic link to supply the capacity and this is a problem if you’re deploying into an area without easy access to fibre (i.e. it can required expensive street works). Instead BT and the US-based semiconductor manufacturer Cavium have teamed up to demonstrate a C-RAN network that can be fuelled by the new G.fast technology, which has shown in a test – conducted at BT’s Adastral Park Labs facility in Ipswich – that it could deliver cellular data over copper lines at speeds of 150-200Mbps (the exact conditions are not known). “Using G.fast to deliver a cellular network is an exciting breakthrough for C-RAN and yet another world first for our team of researchers at Adastral Park. These technologies will play a key role in 4G networks and will be fundamental to 5G architectures. The trials are another step towards a fixed and mobile network which will support customers’ increasing demands for data. We are very excited to collaborate with BT, using Cavium OCTEON Fusion-M™ basestation and ThunderX® server processor technology to validate this new class of Radio Access application with G.fast technology.” said Raj Singh, General Manager of Cavium’s Wireless Broadband Group. The news is particularly poignant given that BT has just started its merger with UK mobile operator EE and will no doubt be seeking to harness the power of both their fixed and mobile networks, which could results in various efficiency and network related cost savings. On the other hand we’re already seeing some single 4G (LTE-Advanced) connections on EE’s network that can push up to 80-100Mbps and EE has previously demonstrated connections that were able to deliver 300-400Mbps, although the limits of radio spectrum (available frequency), network congestion and existing hardware usually prevent such speeds from becoming common. Never the less 4G is continuing to demand more capacity and future 5G networks, which are often promoted as being Gigabit class services, are almost certain to need more capacity than the 150-200Mbps stated above. In terms of G.fast’s commercial availability, we’re currently expecting a major pilot to launch this summer and then the official commercial roll-out should begin during Summer 2017. BT has pledged to make the new service available to 10 million premises by 2020 (roughly 40% of the UK) and “most of the UK” will then be done by 2025, although they will initially only offer the 330Mbps service before increasing to the full 500Mbps over the next decade. Shouldn’t that give alternative network operators plenty of time to deploy fibre in at least the expect large under-served areas? Because BT will everything it can to keep its copper in the ground, at least until 2025. Indeed it should, just as the FTTC/VDSL deployment gave challengers plenty of time to deploy fibre in at least the most economically viable underserved areas. Why it hasn’t happened is a question our dear regulator needs to answer given we’re apparently the most competitive market in the megaverse. Yes that is the plan so.. all the other operators can now jump in and start their fibre rollouts and get in ahead of BT!